Traditionally, two kinds of films come out to capitalize on Valentine’s Day. We either find romantic comedies like the aptly titled Valentine’s Day or movies with a strong female focus such as Fifty Shades of Grey. 2016 offered How to Be Single, a flick obviously meant for the unattached women in the audience but also one with some rom-com appeal. Single did passable business, but it couldn’t rise above third place for Valentine’s Day weekend. In its third weekend, Kung Fu Panda 3 did well enough for second place. So what won Valentine’s 2016? An unlikely pick: a hyper-violent, “R”-rated comic book flick called Deadpool. Not only did it take the weekend’s box office crown, but also its $152 million more than doubled the collective grosses of the next five films combined. All of that led to an eventual US total of $362 million - $762 million worldwide – and that meant a pretty sizable profit for a movie with a relatively modest $58 million budget. Though not without occasional flaws, Deadpool delivers a pretty satisfying superhero effort. 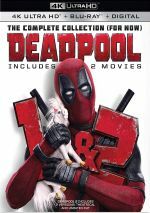 After a prologue introduces us to the character, we learn how wisecracking, violent mercenary Wade Wilson (Ryan Reynolds) became wisecracking, violent superhero Deadpool. After he receives a diagnosis of terminal cancer, Wade undergoes radical treatments, though he does this more out of concern for his girlfriend Vanessa (Morena Baccarin) than for himself. This doesn’t go well, as the procedures cure Wade and give him special powers but leave him severely disfigured. He doesn’t feel he can return to Vanessa in that state, so he uses his new abilities to perform as the anti-hero “Deadpool” – and to get revenge on those who caused his current situation while he also pursues a cure for his hideous scarring. For better or for worse, Deadpool wears its irreverence on its sleeve, and at the outset, I felt inclined to vote “for worse”. Right out of the gate, the movie’s self-conscious attempts at irony and subversiveness rubbed me the wrong way, as the film screamed “I’m different! so loudly that it threatened to overwhelm all else. Only when the movie starts to balance some dramatic elements with the humor/irreverence does it work for me. It needs that contrast, for if all it did was provide silly lines and gags, it'd get old quickly. Reynolds actually does best with the movie's more serious moments. I just don't wholly buy him as a comedic actor - he's the kind of guy who seems like he should be funnier than he is, like he tries really hard to have a comedic persona but it doesn't come naturally to him. But he does well with the movie's more dramatic/darker beats, and those make him funnier. I don't think Reynolds has been a bad actor, but I think he just lacks natural comedic chops. In Deadpool, I really find him to be pretty annoying until the movie lets the character do more than kill people and make wisecracks. Happily, the story turns more serious in fairly short order, so its appeal grows quickly – and it stays entertaining the rest of the way. This seems counterintuitive, as the flick’s fourth-wall-breaking super-irony should grow more tiresome as it progresses, but as I noted, when it balances the comedy with the drama, it creates a satisfying mix. Deadpool does lose some points due to a lackluster villain. Ajax (Ed Skrein) seems like a serviceable baddie at best, and this robs the movie of some tension. We should really want Deadpool to take revenge, but Ajax seems so bland that we care less than we’d like. That’s not a flaw unique to Deadpool, though, as many superhero “origin story” films present mediocre villains. They often occupy most of their time with backstory and don’t have the time to develop a good baddie, so I understand this trend and don’t hold it against Deadpool to a great degree. Especially not when so much of the rest of the film works so well. After a questionable opening act, the movie settles into a rhythm and becomes a lively, entertaining adventure. It’s a bloody, funny blast. Footnote: stick around through the end of the credits for a bonus sequence. 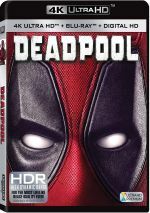 Deadpool appears in an aspect ratio of approximately 2.40:1 on this 4K UHD Disc. Overall, the image satisfied. Sharpness worked well. Nary a sliver of softness materialized, so the flick offered positive delineation. No signs of jaggies or moiré effects occurred, and edge haloes failed to mar the presentation. Print flaws stayed absent. Though the palette favored blues and greens, it eschewed the oppressive teals that dominate so many modern movies. The hues seemed fine within the stylistic choices, and the 4K UHD’s HDR added impact to the tones. Blacks were deep and dense, while shadows looked smooth and clear. Contrast worked nicely, with the expected boost from the HDR. I expected a good presentation and got it. In addition, the movie’s Dolby Atmos soundtrack added spark to the proceedings. Downconverted to Dolby TrueHD 7.1, the soundscape opened up best when it indulged in its many fight sequences. These used the various channels in a vivid, immersive manner that placed the elements in logical spots and meshed together well. The track gave us a strong sense of place and action. Audio quality also pleased. Speech remained natural and distinctive, while music was full and rich. Effects came across as accurate and dynamic, with tight low-end. I liked this mix quite a lot. How did the 4K UHD compare to the Blu-ray version? The Atmos track added some kick, whereas visuals were tighter and offered superior colors and blacks. The 4K brought a nice upgrade. On the 4K UHD itself, we find two separate audio commentaries. 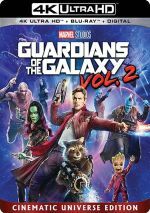 The first comes from director Tim Miller and co-creator Rob Liefeld, both of whom sit together for a running, screen-specific look at the opening credits, story/character areas, cast and performances, costume and visual design, stunts and action, effects, music, and sets and locations. Miller does the heavy lifting here, as Liefeld offers little other than gushing praise for the movie. Actually, Miller's remarks can veer toward the fluffy side at times, but he manages to give us a reasonable amount of filmmaking information. While we learn some good movie-related information here, the commentary becomes a moderate disappointment due to the too-high level of happy talk. For the second commentary, we hear from actor Ryan Reynolds and writers Rhett Reese and Paul Wernick. All three sit together for their own running, screen-specific discussion of the film’s long, slow development, the opening credits, story/character/screenplay subjects, the Deadpool costume, cast and performances, sets and locations, stunts and action. During the early moments, I feared that this commentary would be a dud, as the participants seem slow to warm to the format. However, it gains speed before too long and better digs into the production. It’s still inconsistent but the discussion usually offers a fairly satisfying examination of different topics. The remaining extras appear on the included Blu-ray copy, and 10 Deleted/Extended Scenes fill a total of 19 minutes, 14 seconds. Only one of these counts as major: “Cancer World Tour”, which shows Wade/Vanessa’s attempts to cure his disease and an alternate way for him to leave her. I prefer the finished film’s stab at this, but “Tour” offers in interesting alternate take. The other sequences tend to be less significant. They do little to expand characters or story, as they mainly give us more jokes/violence. That makes them fun but there’s little I’d say would’ve suited the final film. We can view the “Scenes” with or without commentary from Miller. As expected, he gives us background for the segments and lets us know why he cut them. Miller delivers good notes about the excised sequences. Up next comes a Gag Reel. It lasts six minutes, 12 seconds and provides some of the usual goofs and giggles, but it also packs a bunch of alternate lines. That factor makes it above average. Under From Comics to Screen… to Screen. we get a collection of five featurettes. All together, they run one hour, 20 minutes and include notes from Reynolds, Liefeld, Miller, Wernick, Reese, executive producers Aditya Sood and Stan Lee, co-creator/comics writer Fabian Nicieza, producer Simon Kinberg, comics writer Joe Kelly, specialty costume designer Russell Shinkle, makeup designer Bill Corso, production designer Sean Haworth, director of photography Ken Seng, executive producer/unit production manager John J. Kelly, previs supervisor Franck Balson, stunt coordinator Philip J. Silvera, visual effects supervisors Pauline Duvall and Jonathan Rothbart, visual effects producer Annemarie Griggs, 2nd unit director/stunt coordinator Robert Alonzo, special effects coordinator Alex Burdett, utility stunts Regis Harrington, composer Tom Holkenberg, and actors Morena Baccarin, TJ Miller, Brianna Hildebrand, Leslie Uggams, Ed Skrein, and Gina Carano. “Screen” examines the source and its path to the movies, story/character areas, cast and performances, Miller’s test reel and how he got the job. We also hear about costumes and makeup, sets, locations and production design, stunts and action, effects, and music. Like many pieces of this sort, “Screen” starts off a little slowly, but it gets better as it progresses. The program shifts from generalities and praise to dig into the nuts and bolts of the production. These moments offer nice insights. A Gallery breaks into five subdomains. We see “Concept Art” (22 images), “Costumes” (19), “Storyboards” (645), “Pre-Vis” (7:08 of footage) and “Stunt-Vis – Shipyard” (2:03). All of these offer good material, though the interface can be clunky for the stills – especially in “Concept Art” and “Costumes”, where we go through brief collections and constantly need to return to the menu. Within Deadpool’s Fun Sack, we get a mix of components. “Videos” provides 19 forms of promotion, with an emphasis on trailers and teasers. Many of these sell the movie in clever ways, so they’re much more fun than usual. “Stills” includes seven posters. Sneak Peek also presents a trailer for X-Men: Apocalypse. On occasion, the sardonic, self-referential nature of Deadpool threatens to overwhelm. However, it usually stays on the right side of that line and gives us a crazed, action-packed anti-hero tale. The 4K UHD offers strong picture and audio along with a compelling collection of supplements. Deadpool shakes up the superhero genre in a lively manner.